When I saw this recipe in the June issue of Better Homes and Gardens, I knew I had to make it. 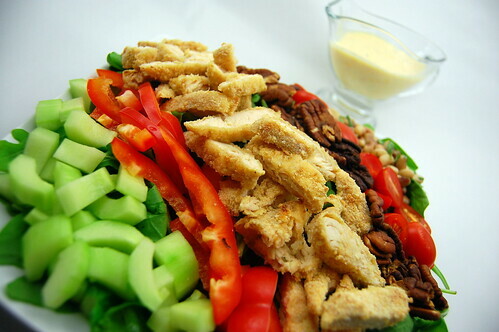 A traditional cobb salad is made with chicken, hard boiled eggs, avocado, bacon, tomatoes, and blue cheese. The southern version uses deviled eggs instead of hard boiled, and adds red bell peppers, fried chicken, pecans, black eyed peas, and tops it off with pimento cheese dressing. I used the recipe as more of an inspiration, and I made my own version. I nixed the deviled eggs since neither Joey or myself are fans. I also breaded chicken tenders and baked them instead of pan frying. I also added some cherry tomatoes and cucumbers, and used my own pimento cheese, and just thinned it out with milk for the dressing. Finally, I used a mix of arugula and spinach instead of iceberg lettuce. The more I thought about it as I was making this, I realized this isn't really a cobb salad. I guess its just a chicken salad with a southern spin. But whatever you call it, its delicious! Allow pimento cheese to come to room temperature. Adding 1-2 Tablespoons at a time, use a hand mixer to beat the cheese until it reaches your desired consistency. Set aside. Preheat oven to 400. Season chicken with salt, pepper, and garlic powder. In a shallow dish, combine the egg, milk, and hot pepper sauce. In 2 more dishes, add the flour and breadcrumbs. Starting with the flour, dredge the chicken, and shake off excess. Dip into the egg, and finally, coat with breadcrumbs. Lay the chicken tenders on a parchment lined baking sheet. Bake 12-15 minutes, or until cooked through. Allow to rest for 10 minutes, then slice into bite-sized pieces. Mix the arugula and spinach on a large platter. 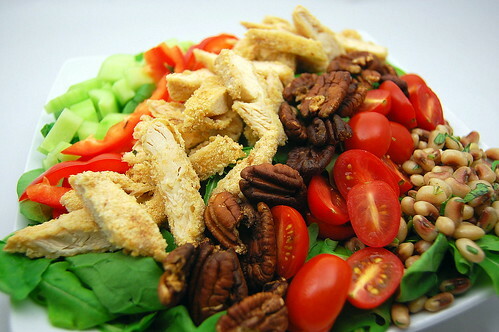 Arrange the cucumber, bell pepper, chicken, pecans, tomatoes, and black eyed peas atop greens. Drizzle dressing over salad, tossing to coat (another note - I probably used less than half of the dressing, and it was plenty). Serve immediately. My hubby would absolutely love this salad. I guess that means I will be making it soon.